Nothing excites Filipinos like the holidays. It’s a magical time filled with meaningful celebrations and traditions – from gift-giving to family reunions and intimate gatherings with their nearest and dearest. This year, Samsung wishes Filipinos a more memorable holiday season with its Merrier Christmas Deals. From October 1, 2018 to January 31, 2019, the tech company will offer its digital appliances at up to 20 percent off in all Samsung authorized dealers nationwide. Aside from generous discounts on their top-of-the-line appliances, Samsung’s holiday promo makes the deal even sweeter by giving customers the chance to bring home eVouchers from 18 dining destinations and travel brands such as TGI Fridays, Shakey’s, The Coffee Bean and Tea Leaf, KFC, 7-Eleven, Agoda, and Pacsafe, when they purchase select models. Samsung Digital Appliances are equipped with pioneering technologies that guarantee to elevate the homemaking experience. Their ingenious features make them the perfect partners for the Filipino family this season. The holidays are a time for rest and relaxation as much as they are a time for festivities. The home becomes the perfect venue for Christmas parties with the Samsung Wind-Free Air Conditioner. It is built with 21,000 micro-holes to evenly distribute cold air within any room, eliminating the unpleasant feeling of direct cold draft and isolated cold spots so guests can stay comfortably cool inside. This revolutionary air conditioner is WiFi enabled. Users can control it from anywhere through Samsung’s SmartThings mobile app. This way, the room can be set to their ideal temperature before they even get there. It also comes with a Digital 8-Pole Inverter Technology, allowing homeowners to savor every minute of their holiday break without worrying about additional costs. Christmas is typically an eventful season. All the errands coupled with the different events that families need to attend can really mess up their laundry schedule—although not necessarily true with the Samsung FlexWash Washing Machine. It is built with two washers and one dryer, enabling two different cycles to run simultaneously. Users can wash their favorite Christmas outfits in the Top Load washer while the holiday linen take a spin in the Front Load Washer-Dryer. With an AddWash door, forgotten items such as a Christmas sock or mom’s holiday cardigan can be added any time during the cycle. This way, everyone is always ready for the season’s celebrations. This powerful washing machine also comes with a Digital Inverter Motor that minimizes electricity costs by maintaining efficient energy use. It also reduces noise and vibration during wash cycles. Families will be spending a lot this season, but it won’t be on their electricity bills. Food takes center stage this season as families prepare for their holiday feasts and the highly anticipated Noche Buena and Media Noche. The Samsung French Door Refrigerator comes with FlexZone™—the ultimate in food storage flexibility. This feature easily converts this compartment’s temperature based on four pre-set temperature settings. For instance, the Soft Freeze setting will prepare your meat for marinating and cooking without the long wait for the food to thaw. How about that leftover food from Christmas and New Year that just won’t fit? Users can easily convert the freezer into a refrigerator by adjusting the settings to gain more fridge space. Temperature fluctuation is also a non-issue with this appliance through its Precise Cooling technology. With its exceptional features and sophisticated body design, this elegant appliance will surely be a useful addition to your home this holiday season. The Samsung Smart Oven is a six-in-one kitchen solution that lets users steam, bake, grill, and even make their own yogurt. It comes with 15 pre-set Cook with Ease menus that allow users to cook different recipes at the touch of a button. The Samsung Smart Oven also comes with the Hot Blast™ technology, which evenly blows powerful hot air to ensure that food is cooked well. The Slim Fry feature, meanwhile, automatically fries food that is crispy on the outside yet moist inside with no need for oil. This multi-purpose appliance will come in handy to make food preparation and cooking more enjoyable this season. 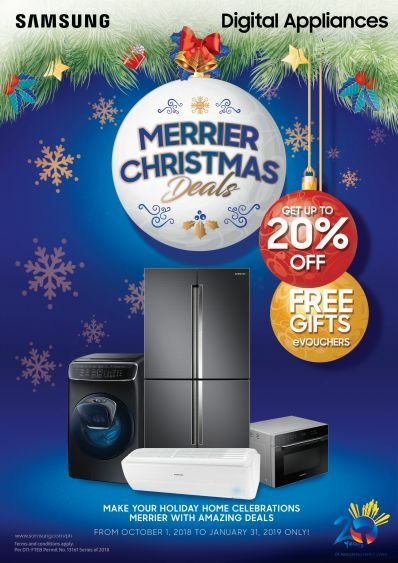 Get these appliances and other select models at great prices with Samsung Digital Appliances’ Merrier Christmas Deals. Available in all participating authorized dealers nationwide.